5 Groovy Green Tourmaline Wedding Engagement Rings To Get Her To Say YES!!! 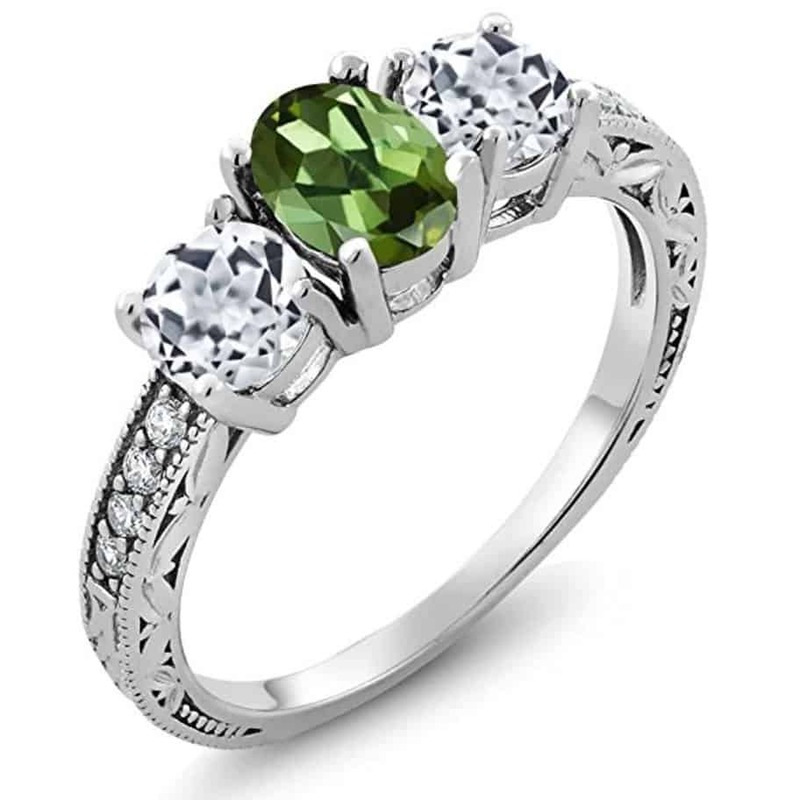 >> 5 Groovy Green Tourmaline Wedding Engagement Rings To Get Her To Say YES!!! Ask any jeweler about tourmaline and pink or green will be the color she shows you. Green tourmaline shades range from light green to dark, vivid green, which can be enhanced with heat. They come in a variety of shapes from square to pear and everything in between. We’ll be covering the oval solitaire shapes for a wedding engagement ring that will truly stun her. If you are dating and plan on proposing to a redhead with green eyes, you couldn’t do any better than a green tourmaline ring. Especially if it’s her signature color, but redheads are not the only women who love tourmaline. 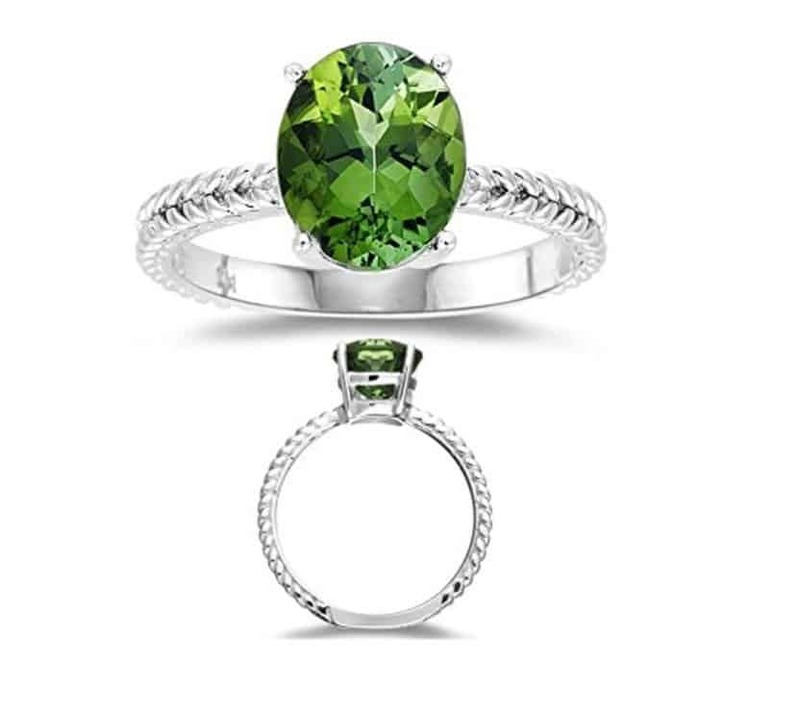 When you want to give her a traditional style yet one that’s quite original, this green tourmaline with white topaz trio is the perfect choice. There’s a channel of beautiful CZ stones on the band, too. The green tourmaline is a natural stone of VS clarity that’s been heat treated to enhance it’s bottle green color. There’s a total of 11 stones in this engagement ring. The tourmaline measures 7 x 5 mm and is set with a 4-prong setting. It’s 0.70 carats while the topaz stones are 0.50 carats and the other stones are 0.02 carats. The band is a 14k white gold finish that is polished to a glimmering shine. It comes in sizes 5 through 9, and has a presentation box included. The manufacturer provides insurance on every purchase for protection during shipping. This medium, dark green tourmaline is 2.85 carats that measures 10 x 8 mm. It’s heat treated to ensure it has a deep green color. The clarity is considered AA by the manufacturer. This ring is resizable but comes in a variety of sizes ranging from 3 to 10 and includes half sizes. The band is 14k white gold with a rhodium finish that brings it extra shine and strength. The braiding on the band gives the ring extra dimension and beautiful, intricate detail. This is the definition of a stunning solitaire engagement ring. When you open the presentation box with this ring inside, she’ll be blown away. It’s a guaranteed YES from her with this ring. While the previous ring was a stunning example of a solitaire that will be much like a traditional diamond engagement ring, this one is a unique example of unconventional engagement ring. It has a single large stone in the center, but it’s surrounded by a cluster of small white diamonds. 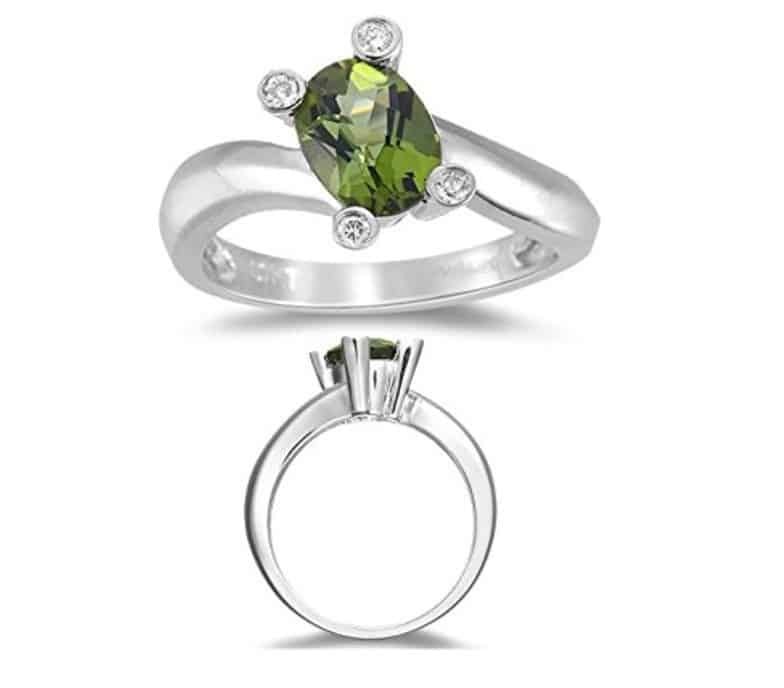 The green tourmaline and diamonds have a total weight of 1.10 carats. The tourmaline is 0.50 carats while the rest of the stones are 0.60 carats. The white diamonds have a clarity of SI1-SI2 in a white gold setting. The ring is available in sizes 4 through 9 as well as being resizable. It’s an incredibly unique piece to be used as an engagement ring during your proposal. She’ll appreciate that you gave the ring some thought and understand her so perfectly. 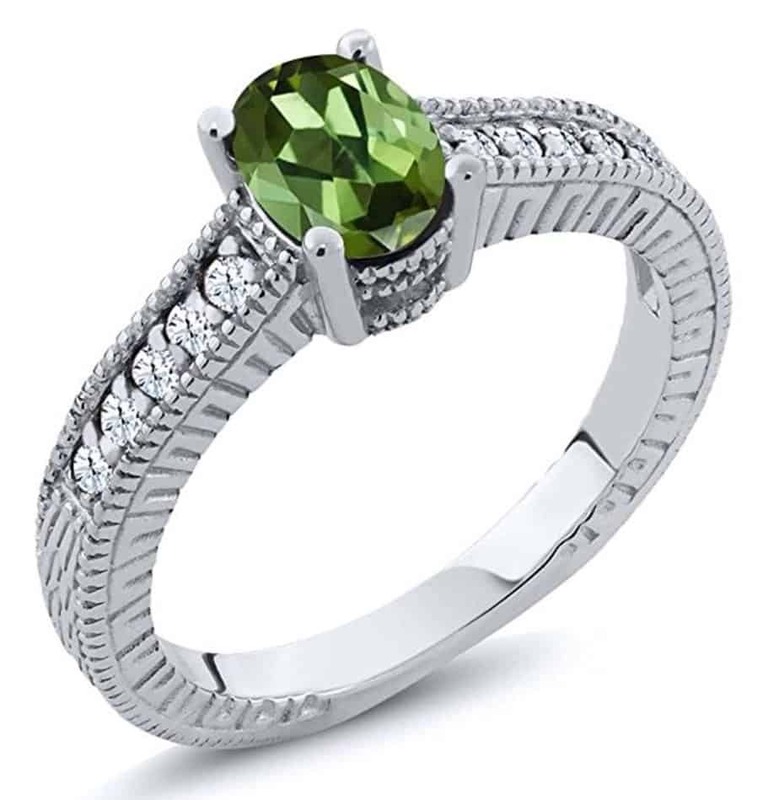 Instead of a traditional solitaire stone in a simple band, you can surprise her with this green tourmaline ring that’s on an angle. At each of the four prongs, there’s a tiny white diamond to create a truly original style. The green tourmaline is a heat treated AA stone that measures 8 x 6 mm. The band is 14k white gold that’s been rhodium plated for strength and shine. The ring can be resized, but it comes in a range of 3 to 13.5, so there’s a size for every woman. It’s a beautiful and original style that she’ll know no one else has for an engagement ring. 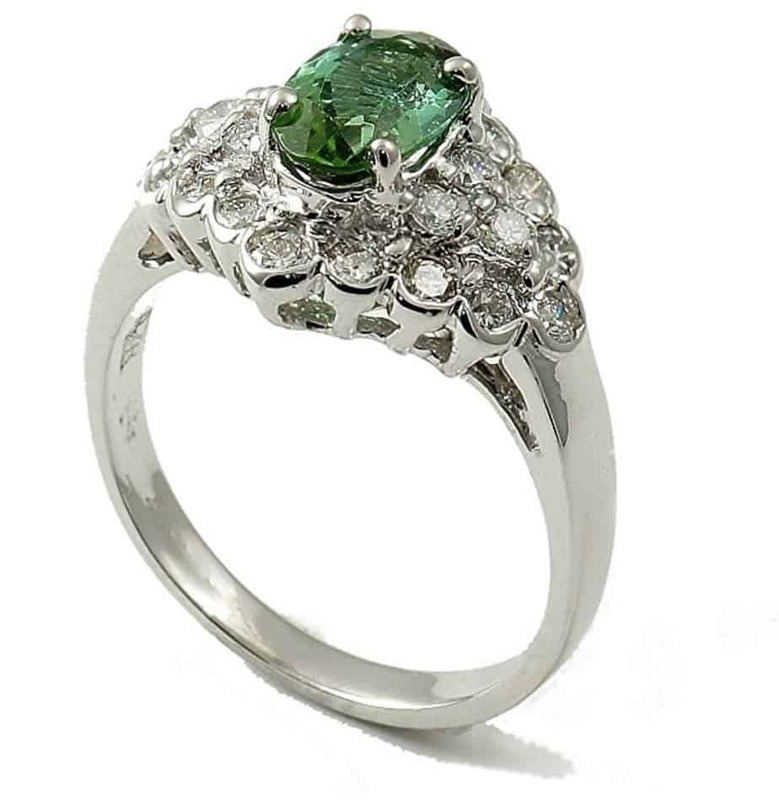 This 14k white gold ring features a single green tourmaline with a channel of white created sapphires down the band. There’s so much intricate detail in the band as well as the setting. The green tourmaline has a minimum clarity of VS and has been heat treated to enhance the color, which is standard with many colored tourmaline and doesn’t impact the value of the stone. The tourmaline solitaire measures 7 x 5 mm and is 0.85 carats. The synthetic sapphires are heat treated to give them a clarity of VS and a color of white. There are 10 sapphires measuring 1.5 mm each. The band has intricate design work that gives this ring a special appeal that she’ll absolutely adore. When it comes to your proposal, it must be truly special and memorable. You don’t want to get down on bended knee and propose to a woman who considers herself nontraditional while holding a traditional solitaire in your presentation box. This is one moment that you can’t ruin or have a do-over. Be thoughtful in your choice of engagement ring.